Make your child’s room standout in the most elegant way with the Vivienne 6-Drawer Dresser by Dorel Living. 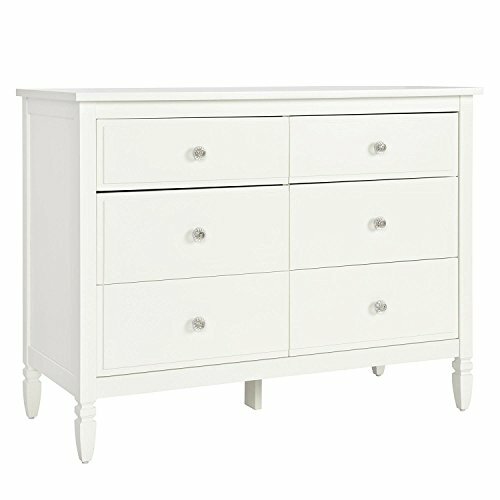 Bright and glamorous, this dresser features chic subtle details such as turned wood feet, six elegant clear acrylic knobs, and clean lines in a white finish, all of which are sure to make a fashion statement in your child’s room. Designed with six spacious drawers, the Vivienne includes two small drawers along the top and four larger bottom drawers. All drawers are equipped with wheel glides that allow for a smooth open and close process. Versatile and adaptable to any age, the Vivienne 6-Drawer Dresser by Dorel Living is the perfect addition to your trend setter’s room.